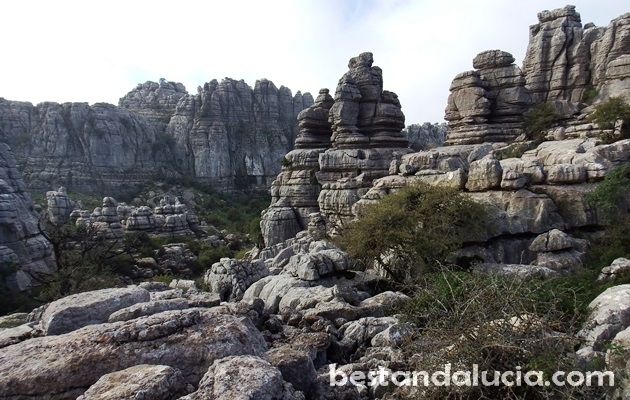 El Torcal Park is a nature reserve located near Antequera in Andalusia, only 40 mins drive from the Malaga airport. It’s famous for amazing and strangely-looking Jurassic age limestone formations. The highest point of the nature reserve is Camorro de las Siete Mesas at 1336 metres. 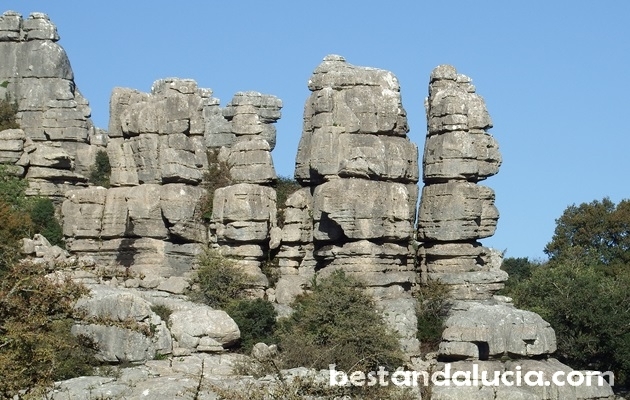 Whether you choose to drive from the direction of Antequera or Villanueva de la Concepcion, the road to El Torcal is full of amazing atmospheric scenary. The El Torcal Centre consists of a medium size parking and visitor’s building. Wandering around the geologically stunning El Torcal is like being on another planet. Under the sea until 150 million years ago, this land was suddenly pushed upwards around that time. Over millions of years she slow but continuous natural forces of wind, snow and rain have shaped the limestone into weird structures. The limestone rocks take most outwardly shapes connecting with each other at funniest angles. Some look like a stack of plates, others remind of a hat, a monster or a human face – depending on the imagination of the person who looks at them. 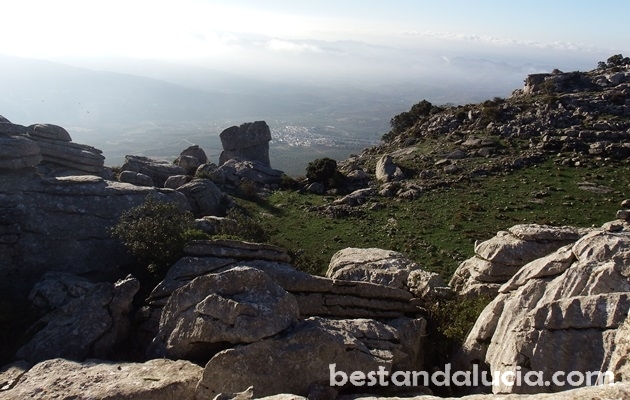 El Torcal de Antequera offers a couple nice walking routes – a green one of 1,5 km, a yellow one of 2,5 km and a red one of 4,5 km – both for the beginners and experts looking for a challenge. Even if you pick the shortest green route you will be able to see plenty of mind-boggling rocks and some wildlife as well, e.g. mountain goats climbing the rocks, foxes hiding in the bushes or vultures circling over the rocks. Additionally, there are two viewing points offering some great panoramic vistas near the car parking. A good tip for photographers is to come very early in the morning when the light is softer and creates nice shadows. 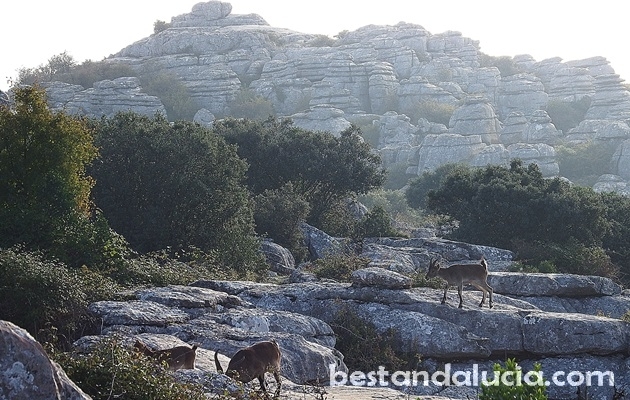 There is also a little bit of fog in the early hours of the days which adds to the spiritual side of Torcal de Antequera. Another tip is to come in spring or autumn, when the sight is less crowdy, and you can enjoy the nature even more. El Torcal can be very hot in July and August. Try to avoid wet season when El Torcal is full of mud and slippery rocks, and even good shoes will not make the walk enjoyable.